This is the largest of the 3 sizes Revere made in this “8000 line”. Through the years, starting about 1968, the logos changed from “Paul Revere Limited Edition” stamped on the handle, to a bicentennial version around 1975 which included a stamp on the bottom with Paul Revere’s signature and the dates “1776-1976”. After 1976, Revere dropped the dates and kept the signature, even changing the labels to reflect “signature edition” instead of the original “limited edition”. You cannot cook 4 quarts in this pan, it will fill it right up to the brim, but Revere named this a 4 quart and I’m not changing the name. This entry was posted in Uncategorized on January 17, 2019 by Happy Blogger. This was originally named a “breakfast unit”. It was made in Rome, NY sometime before 1968. The egg cups on Revere’s egg poachers are designed to pick up with a fork, and if they do not have this unique design, and the center of the tray does not display the Revere Ware logo, it is not genuine Revere Ware, and may not fit your Revere pan correctly. There is a copy of the brochure that came with the original “breakfast units” showing. This is the smaller of the 2 sizes of Revere egg poacher breakfast unit, and they were made from the 50’s up through the early 70’s. Anyone have one of these? Inside across is 11 inches each way, including the lip for the lid. These were made in both this size and a smaller size between around 1953-1956, along with the 12″ griddle, which will be another post. They are great for bacon, because they are square, but you can cook anything in them. The Paul Revere Collection had a couple of different labels over the years, with two different sets of instructions on removing the protective coating. One basically says to soak in hot water, and the other describes using 409 or some other cleaners to remove it, so I assume they have used various types of coatings over the years. You can read the instructions of both by clicking on each picture in this post. If you don’t know which kind you have, I would recommend soaking it in hot water first, and if that doesn’t work, try the cleaner. Keep in mind that these instructions were intended for removal of this stuff 40-50 years ago, so it might not work so well after all these years. It isn’t easy to remove, in my experience, but it must be done if you intend to use them for cooking. This entry was posted in Copper Cleaner, Paul Revere Ware and tagged coating, Cookware and bakeware, Copper, removal, Stainless steel on January 28, 2016 by Happy Blogger. Revere Ware pots and pans. I feel fortunate to have acquired the mini double boiler, and the solid copper whistling tea kettle. The miniature pans were introduced in the 1950’s, and continued sales into the 1960’s, from what I can tell by the old advertisements for them. They really are smaller versions of the full size pots and pans. The tea kettles measure about 3 inches in diameter, so you can get an idea of the size. My set consists of 3 different size sauce pans, a stock pot, two different sized open skillets, a coffee pot, mixing bowl, whistling tea kettle, solid copper whistling tea kettle, and a measuring cup with lid. The measuring cup is the same size as the large sauce pan. All are copper clad on the bottom with double circle logo, but some are pretty faded. The original boxes for these toy pans could be flipped over and made into a stove-top. This entry was posted in Uncategorized on June 20, 2015 by Happy Blogger. This is a great pan! Not just for chicken-frying, but for just about anything. It was made in Clinton, Illinois in 1985. They aren’t super rare, but they are not as easily found as some Revere Ware items. When it is full, it is pretty heavy, so the opposite handle is great for two-handed lifting. This is the newest piece of Revere Ware that I own, and one of the last made in the good old USA. Super low heat is the key to cooking with this pan. As with all Revere Ware, the copper conducts the heat so much better than other metals, so high heat is a no-no. 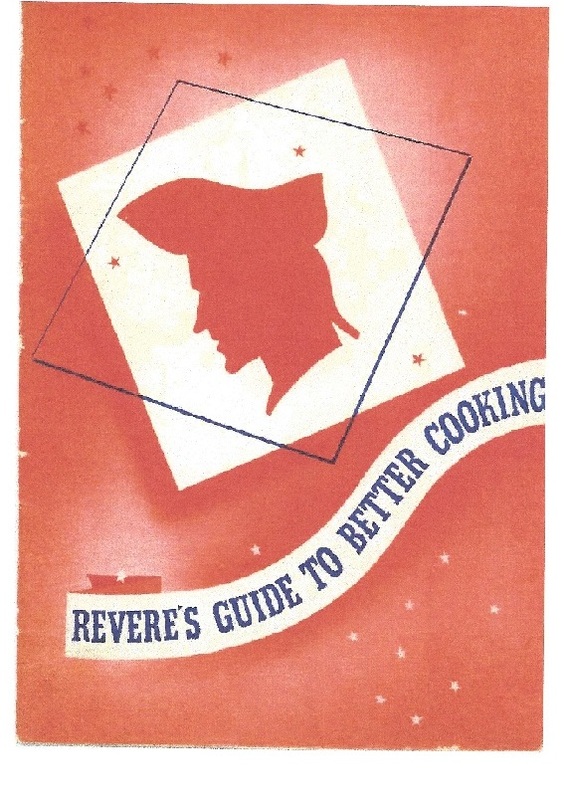 The Revere company put out several recipe books specifically for cooking with copper bottomed Revere Ware pans. If anyone would like a free copy of this e-book, leave a comment on this post, and I will email you one. The book is great, but I have found one thing that removes copper tarnish even better than the cleaners mentioned in the book. If I did all the technical stuff correctly, you can click on the picture of this copper cleaner “Texas Magic Sparkle” and the link will take you to where you can get some. It is all natural, and made from food-grade ingredients, and it isn’t a messy powder, it is a nice gel consistency, so it stays on the copper, and in about 1 minute or less, the copper tarnish is gone! No abrasives either, which I like, because there is only so much copper on the bottom of a Revere Ware pan, so why scratch off any when you don’t have to? This entry was posted in 1968-1978 Revere Ware, Copper Cleaner on June 17, 2015 by Happy Blogger. This pan is HUGE! 10 diameter, it is a steamer on top of a 6 QT Dutch Oven. It was made in 1978 in Clinton, Illinois, and is still perfect. I mostly only use it for steaming/blanching. This pan is one year older than my son, and now I am telling my age! But considering this age, I have learned the importance of fresh vegetables, so gardening is becoming one of my favorite hobbies. When I manage to grow more than I can eat or share, preserving food is necessary. Some of it is easily frozen, but canning and dehydrating are important ways to preserve food, too. Here is where this Revere Ware Steamer comes in. It is a wonderful blanching machine! Many vegetables should be blanched before freezing, or dehydrating. Seems like there is always an excess of squash each year, so this year, I bought a dehydrator for that purpose. Squash that is canned or frozen becomes mushy, and dehydration is supposed to do better. Blanching the squash before dehydrating opens up the fibers, allowing it to better rehydrate, without all the mush. If steam is used to rehydrate, the food is not soaking in the water, as it would be with boiling. 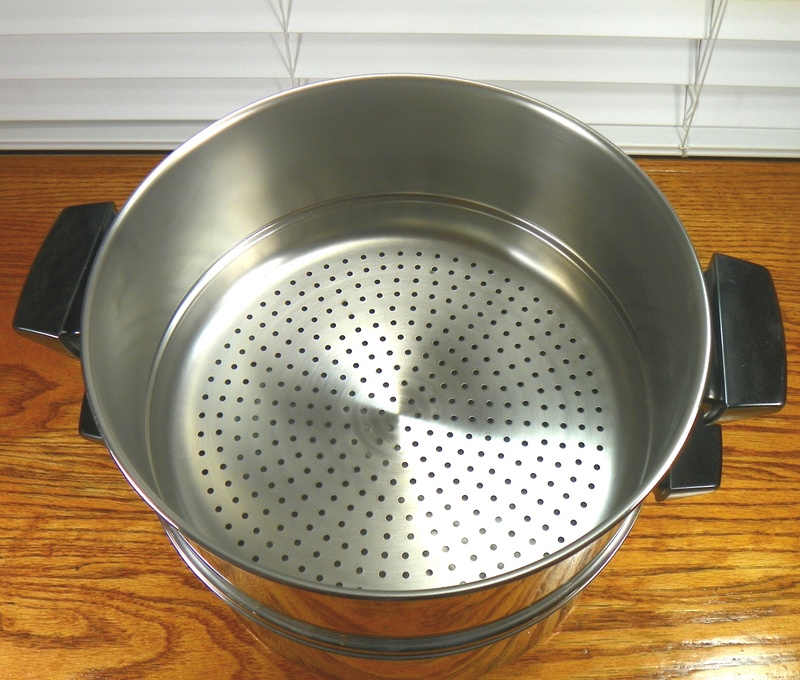 That is where this steamer will come in handy again, it is perfect to rehydrate dried foods. Since it is so big, you can do a large batch, or just spread a smaller amount out across the bottom. Everything the food touches is stainless steel, and the more I cook with stainless steel on the stove, the less I care for plastic and microwave ovens. If anyone has any food preservation tips, please share them! Thanks. This entry was posted in 1968-1978 Revere Ware, Food Preservation and tagged food, preservation, Revereware, steamer on June 17, 2015 by Happy Blogger. 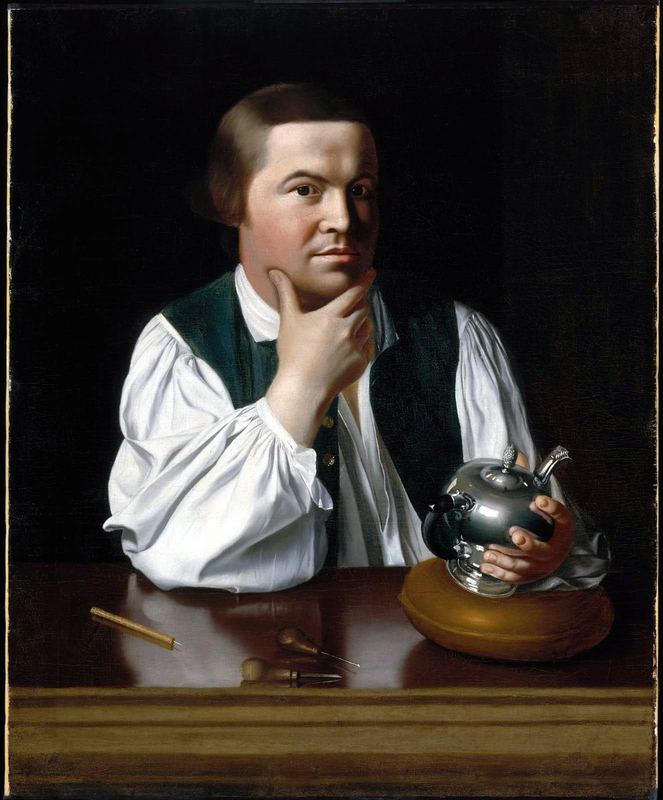 Most of my posts have to do with Revere Ware, the copper and stainless steel cookware, but did you know that Paul Revere was actually a silver smith? Later in life, he started the first copper rolling mill in the USA, but before that, he made many things out of silver. I have always been fond of silver. I love feeling it, hearing it, and just the general sight of it. There is certainly no other metal quite like it. Aside from it being a precious metal, coins used to be made from silver in several mints across the USA. One little known thing about silver is its antiseptic properties. Silver flatware, hollow ware, and table ware, or at least their plated counterparts were used just for this purpose, to stop the bacteria from spreading while contacting food. This entry was posted in Paul Revere, Silver on January 12, 2015 by Happy Blogger. Double boiler insert. I’ve only seen 2 ever. 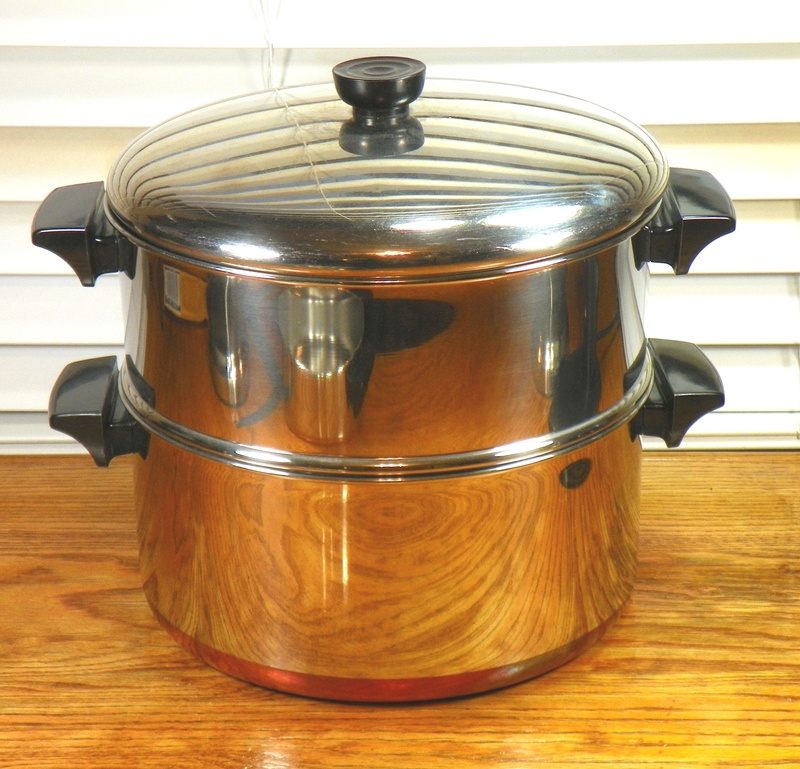 This one fits this 3 qt stock pot, the 2 and 4 qt stock pots, and the 3 qt sauce pan. There is also a ceramic one that is technically a Bain Marie, and it fits the 2 qt sauce pan. See the post here that I’ve written that contains the set and you can see what it looks like. Fondue pot. 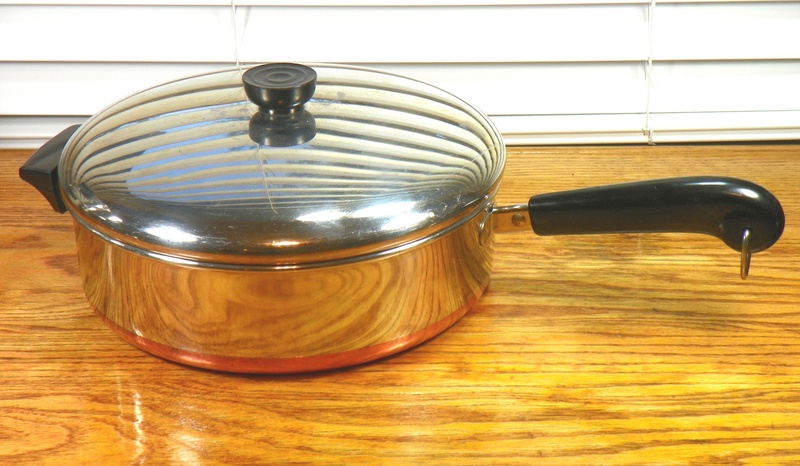 This is the same size pan as the smallest (2 qt) stock pot, but with a single handle. I don’t believe they made them very long, because I’ve not seen one with a signature, but there may be one out there. This is a limited edition. Small round paella or two-handled skillet. The 10″ one is fairly rare, but this small one is only 8″ diameter. Even rarer. This entry was posted in Paul Revere Ware and tagged bain marie, double boiler, sauce pan on November 15, 2012 by Happy Blogger. 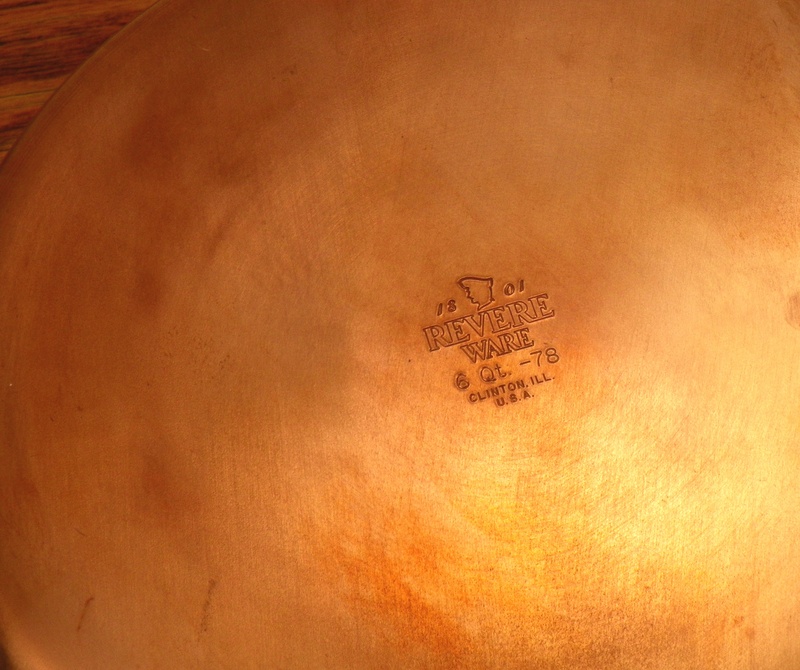 The Revere Company spent years making cookware from the late 1880’s, but during the 1930’s tried to come up with something lighter than the heavy cast iron that was the main source of every day cookware. 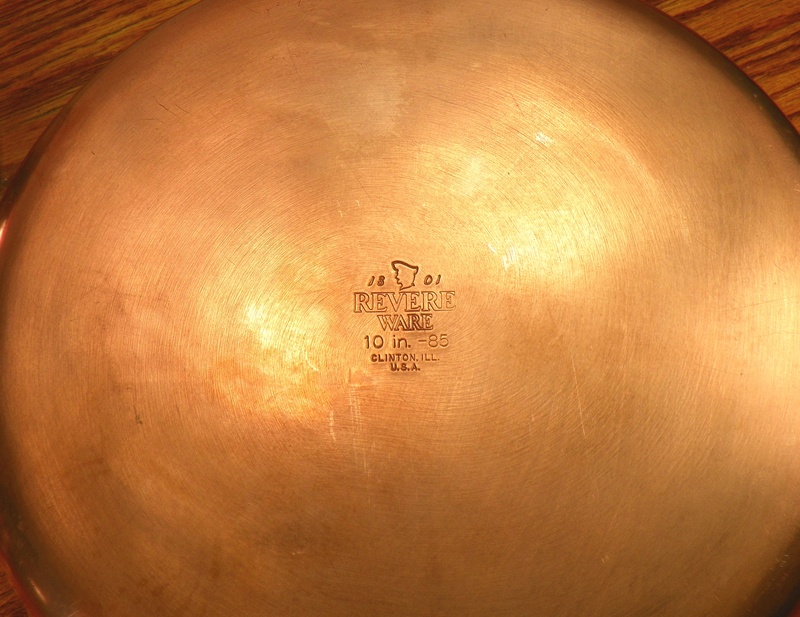 Restaurants and people with a lot of money used copper pans with tin lining, but it was expensive to re-tin. Tin is a very soft metal, almost as soft as aluminum, and a lining was just that, a thin layer inside the copper. Revere was the first to decide that stainless steel was the overall best material for a cooking surface, and spent over two years developing new production techniques. Finally they patented a stainless steel cooking surface, with an electroplated copper clad bottom for better heat distribution, and added Bakelite handles. They applied for the patent in 1938, and introduced “Revere Ware” as we know it today in 1939. 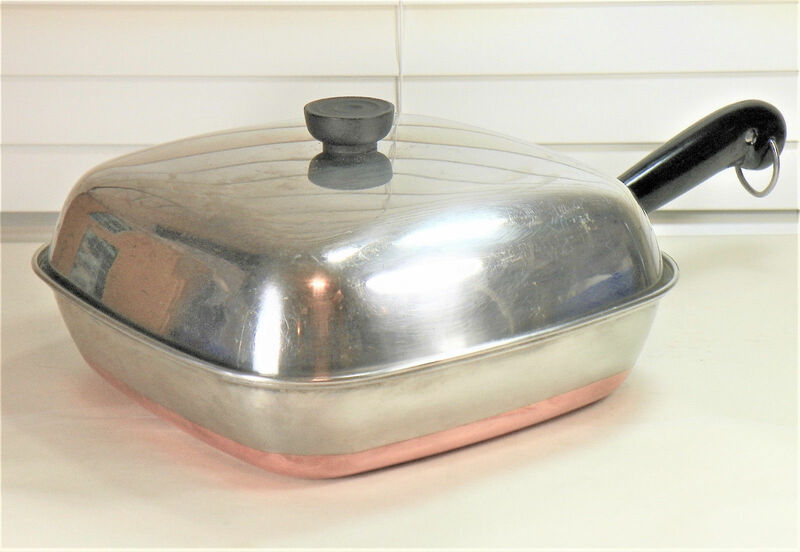 Revere never changed their product materials, although as years went by they used both thinner copper and stainless in their cookware. When their heavy solid copper/stainless cookware came out in 1967 (which includes the Bicentennial edition in 1976, and signature collection after that), they changed the process a bit. Rather than simply electro-plating the copper onto the stainless steel, they used two equal sheets of each and pressure bonded them together. Stainless steel and copper have been the foundation for the growth of the Revere Ware company and much of the history of the evolution of cookware in the 20th century, and Revere Ware proudly displayed their choice of materials on logos, boxes and labels as long as they made them here in the USA. This entry was posted in Pre 1968 Revere Ware on October 23, 2012 by Happy Blogger.